Atlantis Queen is an online video slot game produced by Playtech. The game has 5 reels and 25 paylines, with flexible betting options. The setting of the game is the lost, underwater city of Atlantis with a sunlit backdrop, a coral reef and the host as a beautiful mermaid. Players can expect good quality graphics, Atlantis and ocean related imagery, alongside a calming soundtrack as they spin the reels. Atlantis Queen offers two, exciting bonus features to create more interesting gameplay as well as higher winning possibilities. The Pearl Bonus is a mini-game which is activated when landing 3 of the Mermaid symbols on reels 2, 3 and 4. The bonus round will start by displaying 9 oyster shells. Each oyster shell opens up to reveal either a bronze, silver or gold pearl inside. Each of these pearls have different coin values (Bronze coins are worth 10, Silver coins are worth 30 and Gold coins are worth 50). Player are awarded the sum of all the pearl values displayed. 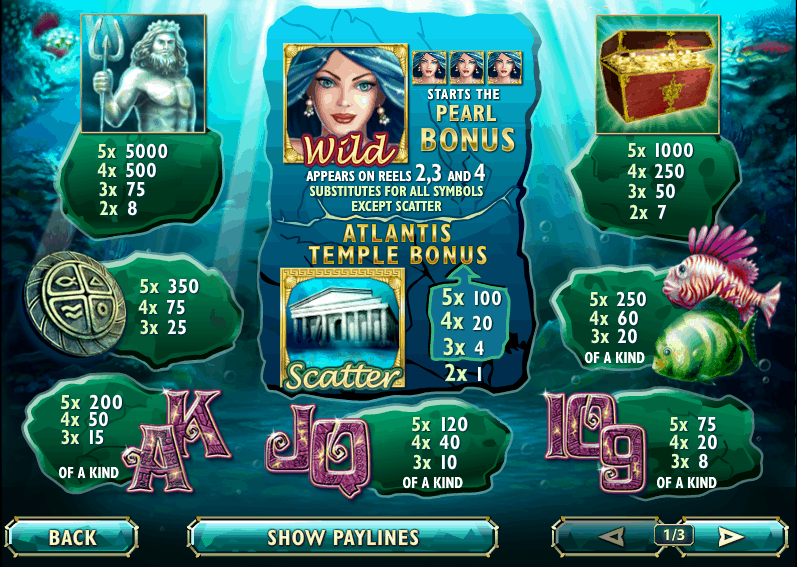 The Atlantis Temple Bonus Game is awarded when landing 3 or more Atlantis Temple Scatter symbols. The game displays a screen with a sandy backdrop and a variety of stones. Click on the stones to flip them over and reveal bonus extras to add to the total amount of free spins. After clicking on the first stone, there's an instruction to either flip all the stones in that row or all stones on screen. The added extras can include multipliers, extra Scatters, extra Wilds or more free spins. 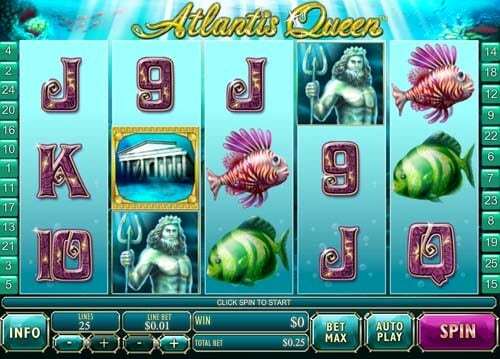 Atlantis Queen is a 5 reel and 25 payline game with a variety of both card and ocean-themed symbols. These symbols include both a Wild symbol and a Scatter symbol. Both of these symbols have special features, some of which have been discussed above. The scatter symbol is that of the Sunken Temple of Atlantis. Landing just 1 or more of these will award players with a cash prize. The amount will depend on the bet amount as well as how many land on the reels simultaneously. Three or more of these symbols anywhere on the reels, will also activate the Atlantis Temple Bonus Game. Atlantis Queen is a seemingly simple video slot from Playtech, but has some interesting bonus features, which add to its appeal. The bonus features are easily triggered, easy to understand and add to profit potential. The multitude of betting options, as well as the AutoPlay feature, are a definite plus as it allows the game to suit a variety of players preferences. The theme may not be highly original, but the high quality graphics make it stand out from similar games within this category.